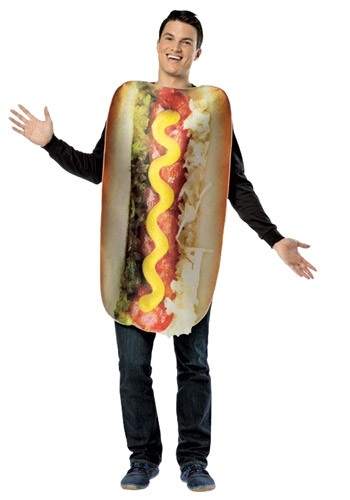 Adult Get Real Loaded Hot Dog Costume By: Rasta Imposta for the 2015 Costume season. When you head to a baseball game there are a few things that you hope will happen like your home team winning or even catching a home run ball but there is one thing that you always be sure will happen. What is that? It would be enjoying a great ballpark hot dog. These savory snacks will make everyone happy when they get one fresh from the stadium. Now you can look just like your all time favorite food with this fun costume.